Arrange the sheets of tissue paper in a stack, and fold one short side up about one and a half inches. Firmly crease the fold, and then make another accordion-style fold in the reverse direction. Continue folding the tissue paper back and forth until you have created a narrow stack of accordion folds. Crease the edges of these folds, and set the stack aside. Cut a piece of florist's wire that is about 18 inches long. Fold this piece in half. Find the center of the tissue stack, and slip the wire over all the layers together. Twist the ends of the wire together to tightly secure the stack of tissue. Twist the wire back on itself to form a loop, and bend the ends up around the tissue again. Cut a piece of thread or fishing wire as long as you would like, and tie one end of it to the loop of wire. Firmly hold the stack of tissue in one hand, and with the other, use the scissors to cut a rounded shape on the end. Cutting through this many layers of tissue can be difficult, so work slowly and use a very sharp pair of scissors. Repeat with the other end of the tissue stack. Trim both ends until they are evenly rounded. Turn the tissue shape on its side, allowing the ends to fan out. Grasp a single sheet of tissue on one side of the wire and gently fluff it out so that it is standing straight up. Use care so you don't rip the paper. Continue separating and unfurling the tissue sheets, alternating sides of the pom pom. Work slowly, fluffing out one sheet at a time. When you've finished unfurling all the sheets of tissue paper, hang your pom pom as desired. After hanging it, arrange the sheets again to make sure they look the way you want. 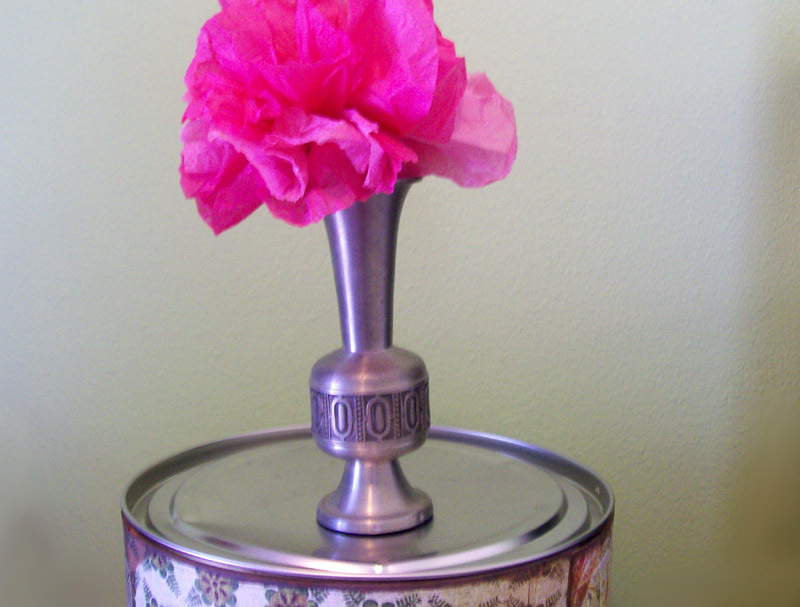 To complement this hanging decoration, consider making tissue paper flowers as a centerpiece.